By Khaleef Crumbley 9 Comments - The content of this website often contains affiliate links and I may be compensated if you buy through those links (at no cost to you!). Learn more about how we make money. Last edited June 13, 2012 . Right now there are billions of dollars in unclaimed money, just waiting to be united with their rightful owner! No, this isn't a scam or some lottery, but various state treasurers and other agencies are holding cash that may belong to you! A recent article on Market Watch highlighted this problem. Well, unclaimed money and unclaimed property are just what they sound like. 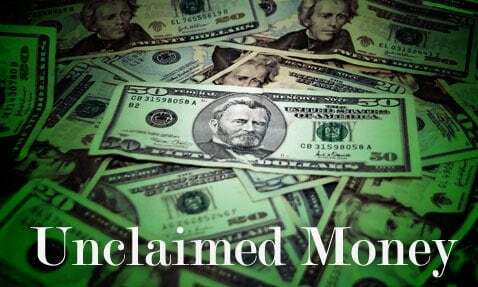 It is money (or property) that has not been claimed by the rightful owner. This homeless money is usually the result of missed paychecks, refunds, insurance settlements, dividends, and even estates. The state of New Jersey is holding an “unknown” amount for Fed Chairman Ben Bernanke, tied to his last known address there. In addition a “Ben S. Bernanke, Stanford” is owed $72 reported to California by American Express Company. Bernanke taught at Stanford in the 1980s and at Princeton in the 1990s. Actress Angelina Jolie is owed $659.01 in salaries and wages reported to the state of California by The Walt Disney Company & Affiliates. Bradd (sic) Pitt of Malibu is owed $5,000, reported to California by Cedars-Sinai Medical Center. Johnny Depp is owed $2,159.06, reported by Porsche Cars North America Inc.
Zsa Zsa Gabor is owed 129.35, reported by Warner Bros. Film and Entertainment. It would seem as though either a failure to report an address change or a clerical error (misspelled name for instance) are the primary reasons behind all of this lost cash! Since you are reading this article, you have no excuse when it comes to keeping your employers, financial institutions, and even relatives updated with your mailing address and contact information! The National Association of Unclaimed Property Administrators has a database that covers both the United States and Canada, which attempts to connect state governments “that actively find owners while protecting forgotten funds until claimed”. You are able to select your state or province, and then enter your name in a search (remember to try common misspellings) to see if you might have some unclaimed money lying around! Their site also provides a lot of information and other tools to assist you in your search. Also, you can check out Missing Money's list of each state's Unclaimed Property Division (or the equivalent for your state). There are also for-profit companies that will help you to check for lost money or property, like CashUnclaimed.com. Be careful however as some of those sites can be a bit shady. Most state treasurers actively cross check public data, use various websites, and some even hold “awareness events” at public functions, all in an effort to match unclaimed property with the lost owners. In FY 2006 there was over $1.75 billion returned to the rightful owners from over 1.9 million accounts! Having the same name that appears in an unclaimed money database isn't enough to claim the cash – you will also need to prove beyond the shadow of a doubt that you are the correct person. Be prepared to show every form of identification that you have, including pay stubs and bank statements. There are also many companies and non-profit organizations that have money due to them, so be sure to check those names as well, if applicable. Don't forget that you may have to pay taxes on your new-found money – especially if it is a payment of income, capital gains, dividends, or even an inheritance. Speaking of taxes, while you're at it don't forget to check and see if you can claim a past tax refund that you never collected! Have you ever had to track down any lost money? Were you ever contacted by a state agency or other company who was looking for the owner of unclaimed money? Do you think there is a more efficient way of handling situations like these? Khaleef, I’ve tried searching for any unclaimed funds in my name, or my family’s names, and unfortunately we don’t have any unclaimed money sitting out there. But you never really do know until you check! Another thing people might want to think about is claiming any past tax refunds that they may be due. Sometimes people end up not filing their taxes not realizing that they’re due a tax refund. There is a 4 year limit on when you can file for a past refund, however. I added a link to an article about it up above. Thanks! UPDATE: Wow, I just tried searching a few more family friends, and found one that had some unclaimed funds of “over $100”. Just notified that person that the money is sitting there waiting for them. Congrats, this post has had it’s first success story! That’s great news! I checked and had nothing in a couple of potential states…but it was still fun! Good point about the tax return, last year the IRS had over $1.6 billion set to expire from 2006! I just checked out my state and didn’t find anything. But it was fun to try! Thanks for letting me know about it. Same here…but it was fun to do the search! I did a few searches and found that my wife is owed $50 from Sprint. This is probably for one of their rebates and she never deposited the check. I did a few other searches and found several random people in CA that are owed hundreds of dollars! Khaleef, great article for sure. It is really important for consumers to search each and every year for their unclaimed property. I ran across your site in our work for non-profits and community churches. One of the sites you may wish to report to your readers is http://www.LostMoney.com LostMoney raises money for community churches and non-profits across America. Over $5 million per year. This is done through donation pledges by the consumers LostMoney helps in the recovery of their unclaimed property for free. It is a consumer advocate site. Thanks so much for your article. I look forward in reading more and will check back. PREVIOUSLY I STATED THAT I NEEDED CLAIM FORMS; HOWEVER, I FORGOT TO INCLUDED THE SOURCE WARRINGTON. MAYBE THEY ARE VERY BUSY AND UNDERSTAFFED, SO WOULD YOU FORWARD THE FORMS TO ME IF POSSIBLE. THANKS IN ADVANCE. BE BLESSED.